Sponsored, hosted and organized by NewSeed Advisors and SPIN Farming, with additional co-host U.S. Venture Partners (USVP), the Agriculture 2.0 Silicon Valley 2010 Event, held March 24, 2010, at the Four Seasons Hotel in Palo Alto, California, was the first West Coast conference of its kind, bringing together venture capital firms and early to late stage start-up companies with a focus on sustainable agriculture. This marked a notable convergence of cleantech, and even biotech, within the agricultural sector. In her opening address, Janine Yorio explained that the agricultural industry contributes more green house gases (GHG) in the U.S. than all of transportation combined, totaling up to “30% of U.S. GHG emissions”. With the U.S. itself contributing almost 25% of world GHG annually, reduction in U.S. GHG agricultural emissions is a key component to any GHG solution. On that sustainability premise, the conference delivered a day of keynote, panel, and company presentations on sustainable “agtech” innovations and included a separate conference track on sustainable aquaculture sponsored and organized by Aquacopia Capital Management LLC, a venture capital firm specializing in aquaculture. Approximately 250 investor representatives, farmers, agtech professionals and academia were in attendance, including representatives from Draper Fisher Jurvetson, Foundation Capital, Kleiner Perkins, Khosla Ventures, Mindful Investors, Mohr Davidow, Open Prairie Investors, Nexus Venture Partners, Rockport Capital Partners, RSF Social Finance, and U.S. Venture Partners, to name a few. Tom Tomich, U.C. Davis professor and Director of the Agricultural Sustainability Institute at the university, provided one of the main keynote addresses, focusing on practices that promote a sustainable and secure food industry. Mr. Tomich highlighted that while agriculture represents only 4% of California’s economy, 20% and 40% of California land area and fresh water, respectively, are allocated to agriculture. San Francisco-based FarmsReach pairs farmers up with buyers for sustainable local food systems, helping buyers source produce locally and support healthy farms. Founded in 2007, the online marketplace opened its public beta version in February 2009. It currently serves the San Francisco Bay Area and a few other regions, but aims to be nationwide by the end of this year. Melanie Cheng: We all have the idealistic wonderful definition where everything is ecologically sustainable. It’s beyond organic: Everyone is paid a fair wage and people of all income levels are eating fresh, healthy local foods. That’s the big dream for all of us, but the reality is that everyone–from farmers to distributors to buyers–is in different stages of getting there. So it’s more a matter of journey and where you are along that path. There are so many variables for a sustainable food system. Everyone is good as long as you’re on the road somewhere. So for some farmers who have been using chemicals for 50 years, it might just be using less, and it’s okay, because at least they’re down that path. Whereas a farm that has been farming organically for 45 years may want to go further and think about water, habitation, etc. They’re all good as long as the intention is on the bigger dreamland goal. FC: What do you think is the biggest challenge facing sustainable food right now? Numerous new projects are currently underway to help small and mid-sized farmers get their fruits and vegetables directly into the hands of foodservice operators, farmers markets and retailers. The projects also include initiatives that help to educate consumers on the source of their food via avenues that enable them to learn about the farmers — and in some cases, even interact with them. Most projects are using technology to streamline the process, and growers everywhere are taking advantage of the opportunities. One such project is being run by FarmsReach, a San Francisco-based company that is using technology to bring farmers and buyers together. The company was founded in 2007, and although it currently focuses on the San Francisco area, it plans to roll out the program to other areas in the country in 2010. Tom Grace, vice president of programs for FarmsReach, explained that the program is an on-line marketplace for farmers, retailers and foodservice operators that provides a venue for them to connect. It was developed in response to the locally grown demand. 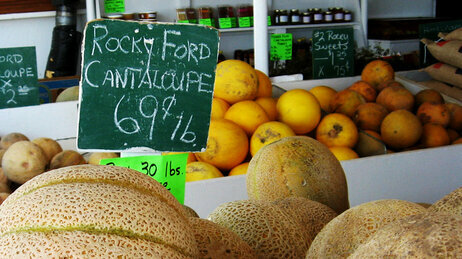 Mr. Grace thinks of Farms_Reach as an eBay for buyers and sellers of locally grown produce. For example, a chef at a San Francisco restaurant might log on to the site at the close of his shift to place his produce orders for the next couple of days. He views what growers have available and places his orders. Using FarmsReach is a simple process. Producers create their stall where they list food, pricing, packaging and other relevant information. They update their stall continually to ensure that the items they have on hand are listed and which days they can deliver to specific locations. Once everything is ready, the producer opens his stall for business, and the produce is available immediately for buyers to search.